The School of Public Health and colleagues from the academia have been asking me couple of times, What is the difference between conventional statistical methods and machine learning techniques in predicting disease outbreak. I quote, for example, people say, “I’m not going to use this sample because that patient had a different drug treatment”. In statistics, we have learned to take data sets and select samples making sure there are no confounding factors. Keep in mind when we do this, it does not capture the heterogeneity of the disease or the pattern that we are trying to study and this is the reason why, we cant extrapolate and come up with novel findings as we program ourselves to a control environment (homogeneity) while in (AIME) extract, compile, analyse heterogeneity complexity in order to replicate the findings in other countries, combining various types of data sets in order to understand an outcome. It is okay to have heterogeneity. Using dirty data allows you to account for heterogeneity (not just me, but even Prof Khatri from Stanford University Published an article on this as well). But remember, to be sure that heterogeneity will not compromise our results, we need to have stringent criteria for validating purpose, just to make sure that statistical associations that we establish, in my case, between weather, environment factor and disease outbreak conditions were not by chance. This stringent validation process had to be done in an independent way, and not related to a previous publication or a controlled environment, is another key point to take. I quote “Dr Khatri from Standford published a set of guidelines so anyone can do it. It compares several methods and is quite technical, but here is the punch line: Reproducibility is good (greater than 85 percent) when you use three to five data sets with a total of 200-250 samples. Which statistical/meta-analysis method you choose is not important. What really matters is not having a large, homogeneous data set but rather multiple heterogeneous data sets” – Dr Khatri. Different from what we are taught in Public health Schools! Large Data Sets, Exclusion Criteria & Inclusion Criteria! In Khatri’s method, we include all of them then we validate them. I also believe that using heterogeneous data (not in a controlled manner for specific study) is not just good, but required as there will be heterogeneity across data sets. However, many researchers prefer published papers, clean and homogenous data sets, but keep in mind of research biases in literature. The gist is that forming hypotheses based on what’s been published is akin to looking for your keys under a random street lamp because that’s where the light is better. There are more things out in the dark that are yet to be found…. Zika or Data. Briefly, Zika is a vector borne disease, spread by Aedes Aegypti and the news channel loves it. Were the news channels reporting wrong numbers? or were the Brazilians under-reporting their cases previously, as a result now leading to a sudden surge in reported Zika cases linked to microcephaly. Let me take you through this discussion. My main objective in writing this blog is to allow us to think critically and analytically. As public health physicians, it is important for us to digest this data before we conclude an association / correlation or causative-effect of an issue. Currently Public Health authorities are suggesting that the two (Zika & Microcephaly) are more than coincidental. 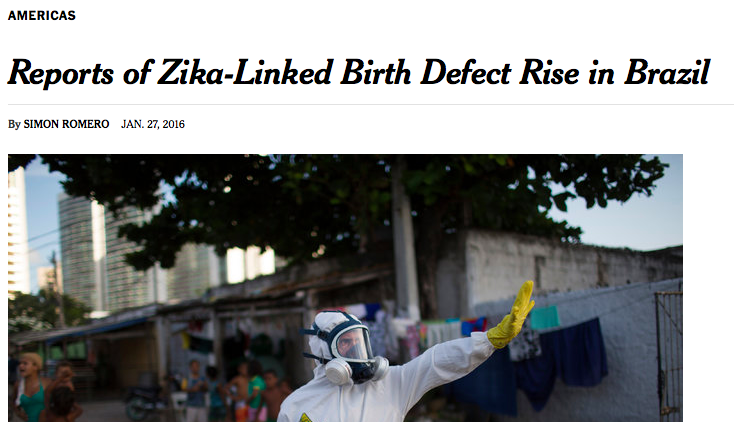 In other words, women who contract Zika in Brazil “may find” their newborns suffering from misshapen of the skull. Let me rephrase and make things clear here. Brazil had cases of microcephaly even before Zika was reported. 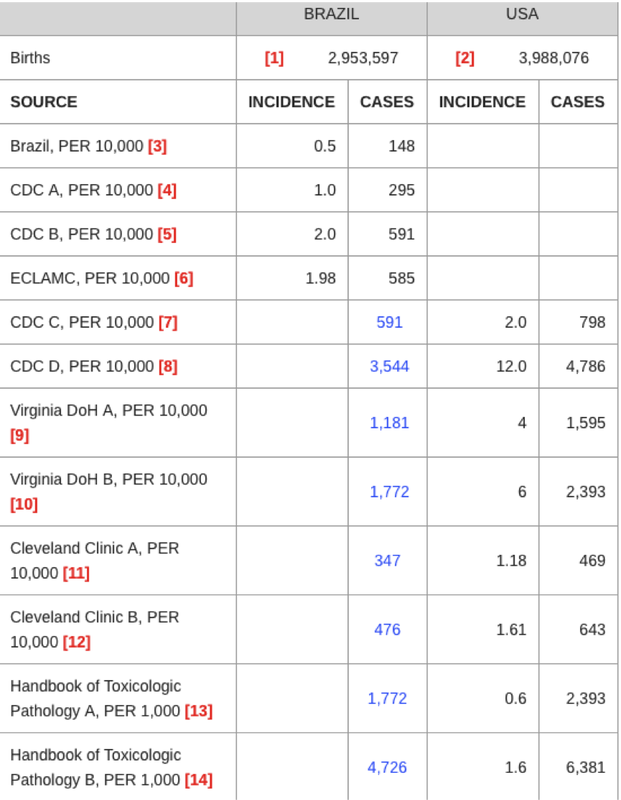 These tables below use a variety of different sources with differing microcelphaly incidence rates to predict the “normal” number of microcephaly cases for both the United States and Brazil. America’s North Shore Journal explained that Brazilians have claimed their national incidence for microcephaly is 0.5:10000. That suggest they have an estimated 148 cases of the birth defect yearly. However, a study on the prevalence of toxoplasmosis in Brazil suggested that as many as 927 births every year suffer “neurological disease”, including cases of microcephaly (Dubbed etal., 2012). This, alone, seems to indicate that Brazil has under-reported its case count. Lets go back to the basic principles of Public Health Medicine. What is an outbreak? A disease outbreak is the occurrence of cases of a disease in excess of what would normally be expected in a defined community, geographical area or season. The key word here is occurrence of cases in excess is considered an outbreak. So did Brazil actually experience an excess of microcephaly cases? or was it under-reported the whole time and now damage control is been done…. I will leave it to you to decide. I believe it is important for us to know the preexisting microcephaly rates before we conclude, correlate or associate microcephaly with another problem (Zika). I quote from the America’s north shore Journal “In a Jan. 26 article in Nature, Declan Butler explores the possibility that the increase in reported microcephaly cases in Brazil is unrelated to an outbreak of Zika viral illness"
Latin American Collaborative Study of Congenital Malformations (ECLAMC) reported that the Brazilian authorities are using an unproven criteria for microcephaly. The government has changed the diagnostic criteria to reflect that all children with a head circumference of less than 33 cm should be reported as a case of microcephaly. More than one study has noted that the WHO charts vary from those produced by the CDC. “For children in industrial countries, the mean OFC (occipital-frontal circumference) is larger than that indicated in the WHO standard values, which are based on measurements taken from about 8500 children in Brazil, Ghana, India, Oman, and the USA.” (Hagen et al., 2014). Food for thought…. We must have a clear definition of a particular disease in an outbreak, determine its baseline rates and crunch those numbers to get the best answers out of it. 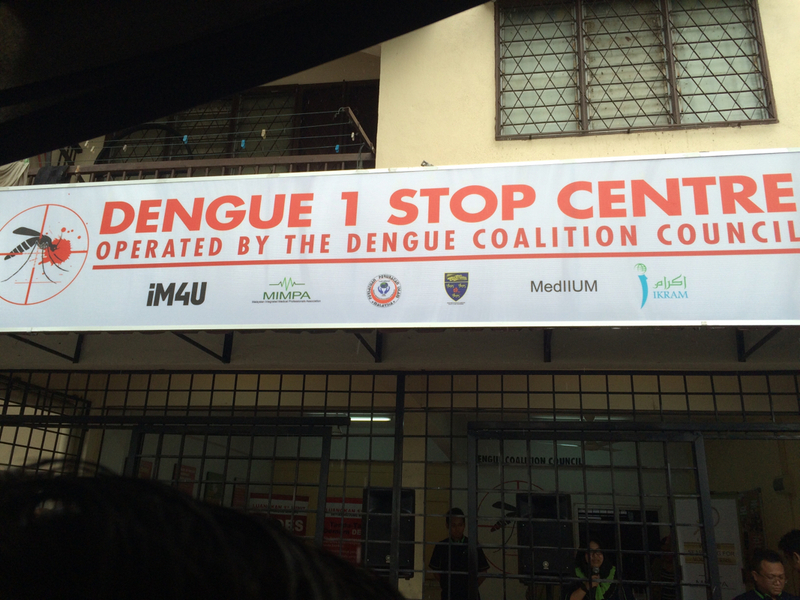 Lets not jump the gun and create panic and chaos of a newly emerging infectious disease. Portugal Flávia Batista, Campos Mônica Rodrigues, Carvalho Juliana Ribeiro de, Flor Luisa Sório, Schramm Joyce Mendes de Andrade, Costa Maria de Fátima dos Santos. Disease burden in Brazil: an investigation into alcohol and non-viral cirrhosis. Ciênc. saúde coletiva [Internet]. 2015 Feb [cited 2016 Feb 01] ; 20( 2 ): 491-501. Available from: http://www.scielo.br/scielo.php?script=sci_arttext&pid=S1413-81232015000200491&lng=en. http://dx.doi.org/10.1590/1413-81232015202.01142014. Dubey JP, Lago EG, Gennari SM, Su C, Jones JL. Toxoplasmosis in humans and animals in Brazil: high prevalence, high burden of disease, and epidemiology. Parasitology. 2012 Sep;139(11):1375-424. doi: 10.1017/S0031182012000765. Epub 2012 Jul 10. Microcephaly; Is Zika The Culprit? Disclaimer: This write up does not represent the Ministry of Health of Malaysia or University Malaysia Sarawak. It is based on my personal opinion & observation as a Public Health Doctor. The ongoing debate is whether Microcephaly in Brazil is associated / causes / related to Zika Virus or not. It is definitely a difficult task to pinpoint on something. There are still many uncertainties about Zika. Is history repeating? Remember the Pellagra infection theory? whereby 100,000 deaths was recorded in a small maize growing town in the United States due to delay in identifying the root cause of the outbreak. “More than 2,100 pregnant Colombian women are infected with the mosquito-borne Zika virus, the country's national health institute said on Saturday, as the disease continues its spread across the Americas”. Keep in mind that both these news indireclty explains that there are other possibilites or confounding factors that contributes to Microcephaly. Brazil reports Zika and Microcephaly while Columbia’s cases are reported to have no microcephaly or deaths from the same Zika virus. Going back to our story about Pellagra. In 1735, something happened in the United States. Pellagra is a vitamin deficiency disease most frequently caused by a chronic lack of niacin (vitamin B3 or synonym: vitamin PP) (from: Pellagra Preventing factor) in the diet. More than 100,000 people died in the United States as health authorities treated it as an infection, and refused to accept it as a vitamin related disorder. They were to busy trying to prevent its spread through water, human contact etc. Things became out of hand,….too late….thousands died. Some researchers even ate the faeces, sweat, & saliva of the Pellagra patients to prove that it was not infective. The Health Authorities did not accept the findings. Apparently, this particular small town in the US had introduced a new machine that accidentally removes (shears) the outer layer of a Maize, hence removing the niacin-vitamin PP. The maize eating population finally suffered from Pellagra - skin itch, diarrhea, & paralysis before death. Finally, Casimir Funk, who helped elucidate the role of thiamin in the etiology of beriberi, was an early investigator of the problem of pellagra. Funk suggested that a change in the method of milling corn was responsible for the outbreak of pellagra, but no attention was paid to his article on this subject. One fine day…….when the maize shearing machine & milling technique was imporved, the (maize was eaten with the outer layer)…..Pellagra disappeared from the town. Sadly the solution was discovered after a few hundred thousand deaths…. Returning back to our discussion on Zika and microcephaly. Do you all know what is Isoretinoids? ​Brazil has been importing massive amount of Isoretinoids. The last known contract was given on 2014. 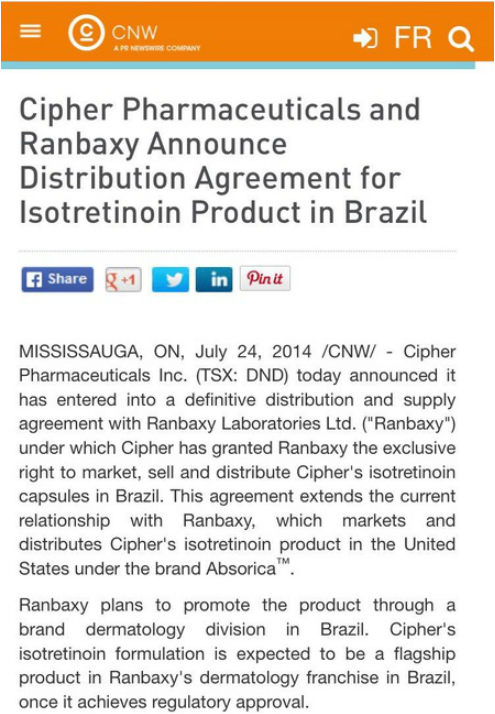 I quote from the article "Brazil is the largest isotretinoin market in Latin America, with annual sales exceeding CDN$50 million, and the market has been growing solidly, providing a compelling opportunity for our novel formulation." If a women uses facial & body cream-with Isoretinoids (derivative of vitamin A), there are high possibilities of giving birth to microcephalic baby (misshapen skull). Once this cream is used, it can stay in the body for more than 5 years (anecdotal / some literatures are available). This cream is commonly used & sold illegally in certain areas in Asia & Latin America as well. I am not saying that pharma companies are responsible for this (This is still my assumption) but lets divert our attention to the chemical substance that could possibly cause this defect (I might be wrong too). These creams could be the one of reason of microcephaly and I strongly believe other cofounding factors and variables exists that could contribute to this event as well. Now, Is Zika virus really causing microcephalus in Brazil? Microcephalus is highly reported in Brazil; Brazil reports almost 150 cases of microcephalus annualy. Second question, are they prescribing to this kind of beautification cream (illegal creams) that contains Isotretinoin? Keep in mind that Isotretinoin in high doses can affect the nervous system, causes genetic malformation on DNA and the obvious reason of microcephaly as well. Well….we knew this was coming. 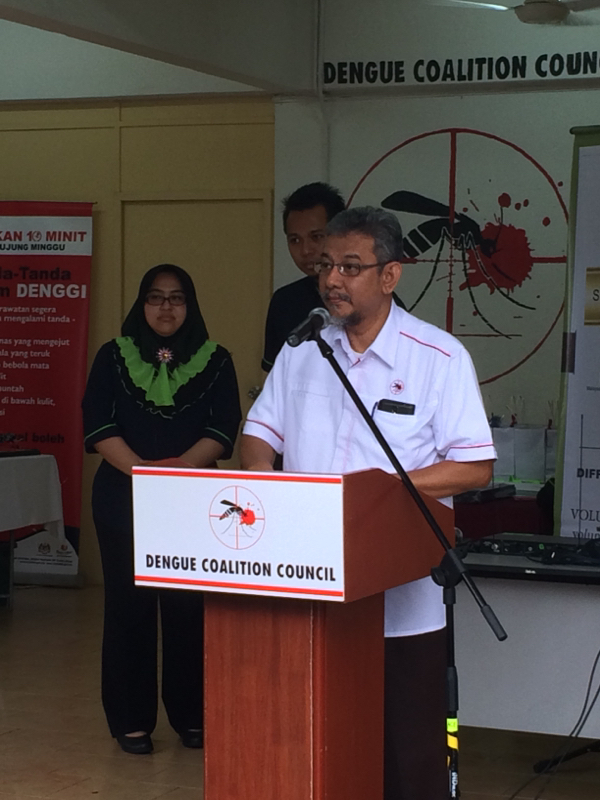 We had the knowledge about the distribution of Aedes aegypti on the global scale, so why did we choose to be silent and react only when there is chaos? In order to stop a deadly outbreak, you gotta stop the bureacractic approach first, and trust me everything else will fall in place. Exponential Medicine & Public Health in Singularity, NASA Ames Research, Silicon Valley. Firstly, let me introduce few interesting people. Dr Daniel Kraft, Chair of Exponential Medicine & Neuroscience, Faculty of Medicine, Singularity University, NASA Ames Research Park, Silicon Valley, CA. It was definitely interesting to listen to Dr Daniel Kraft's experience and lecture on Exponential Medicine. He spoke about major challenges in healthcare: Cost, Access, Variation in clinical practice, Inefficient use of information defensive medicine and many more. He also mentioned that Medicine is really a convergence track. It involves many other track such as AI, Robotics, Computer science and etc. The future of medicine should be cheaper, smaller, faster and better. He also demonstrated portable ECG sensor (plug and play on iPhone) to detect early heart disease, Uber (Doctor Service) online physician-patient consultation and many more. The art of exponential medicine should move towards: Buildable-->Moveable-->Cartable-->Wearable-->Insidable. It is possible that (AI) takes over doctors one day. All they need to know is to learn how we behave and adopt. Daniel Kraft is a Stanford and Harvard trained physician-scientist, inventor, entrepreneur, and innovator. With over 20 years of experience in clinical practice, biomedical research and healthcare innovation, Kraft has chaired the Medicine Track for Singularity University since SU’s inception, and founded and is Executive Director of Exponential Medicine, a program that explores convergent, rapidly developing technologies and their potential in biomedicine and healthcare. Following undergraduate degrees from Brown University and medical school at Stanford, Daniel was Board Certified in both Internal Medicine & Pediatrics after completing a Harvard residency at the Massachusetts General Hospital & Boston Children’s Hospital, and fellowships in hematology, oncology and bone marrow transplantation at Stanford. He has multiple patents on medical device, immunology and stem cell related patents through faculty positions with Stanford University School of Medicine and as clinical faculty for the pediatric bone marrow transplantation service at University of California, San Francisco. Daniel’s academic research has focused on: stem cell biology and regenerative medicine, stem cell derived immunotherapies for cancer, bioengineering human T-cell differentiation, and humanized animal models. Clinical work focuses on: bone marrow / hematopoietic stem cell transplantation for malignant and non-malignant diseases in adults and children, medical devices to enable stem cell based regenerative medicine, including marrow derived stem cell harvesting, processing and delivery. He also implemented the first text-paging system at Stanford Hospital. Dr. Kraft recently founded Bioniq Health, focused on enabling connected, data driven, and integrated personalized medicine. He is also the inventor of the MarrowMiner, an FDA approved device for the minimally invasive harvest of bone marrow, and founded RegenMed Systems, a company developing technologies to enable adult stem cell based regenerative therapies. Daniel is an avid pilot and has served in the Massachusetts and California Air National Guard as an officer and flight surgeon with F-15 & F-16 fighter Squadrons. He has conducted research on aerospace medicine that was published with NASA, with whom he was a finalist for astronaut selection. The second interesting speaker that I would like to introduce is Dr Eric Rasmussen. 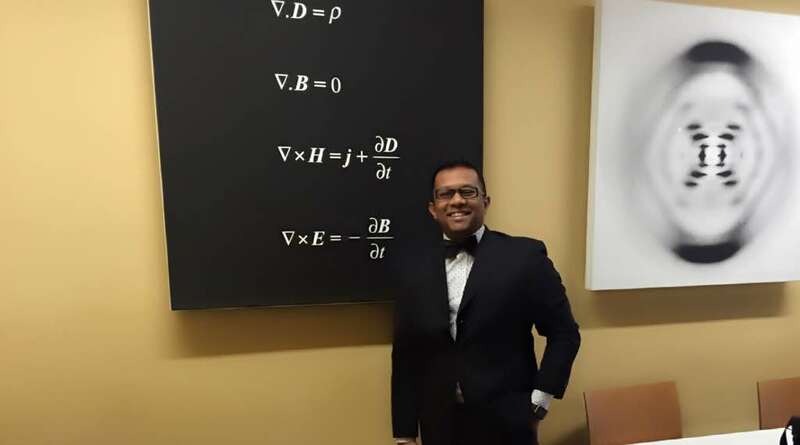 By training he is a Board-certified Internal Medicine physician with both undergraduate and medical degrees from Stanford University and a Masters degree in disaster medicine from the UN World Health Organization’s affiliate CEMEC (Centre European pour la Medecin des Catastrophes) in Italy. He was elected a Fellow of the American College of Physicians in 1997 and a Fellow of the Explorer’s Club in 2014. n addition to his corporate responsibilities Eric is a Research Professor in Environmental Security and Global Medicine at San Diego State University and an instructor in disaster medicine at both the International Disaster Academy in Bonn, Germany (BBK, or Bundesamt für Bevölkerungsschutz ind Katastrophenhilfe) and the Institute for Disaster Preparedness at Tsinghua University in Beijing, China.He also serves as Permanent Advisor to the UN Secretary-General’s High Level Expert Panel on Water Disasters, and is a member of the US National Academy of Science’s Committee on Grand Challenges in Global Development. Rasmussen served as a physician in the US Navy for 25 years aboard nuclear submarines, amphibious ships and aircraft carriers. His positions included Fleet Surgeon for the US Navy’s Third Fleet and Chairman of an academic department of medicine in Seattle. Among his wartime deployments are Bosnia (x3), Afghanistan (x2), and Iraq for ten months. His disaster deployments include Supertyphoon Haiyan in the Philippines, Haiti’s earthquake, Banda Aceh for the tsunami, Superstorm Sandy in New York, and New Orleans after Hurricane Katrina. This Interesting man spoke more on Public Health Challenges in regards to Ebola and other famous world outbreaks. Using Robots to help us in outbreak is something that we need to look into. Exponential Technologies in Singularity, NASA Silicon Valley. We had a great introduction to Singularity University & Nasa Ames Research Park. Two extraordinary speakers Ray Kurzweil & Peter Diamonds today. Ray Kurzweil has been described as “the restless genius” by The Wall Street Journal, and “the ultimate thinking machine” by Forbes. Inc. magazine ranked him #8 among entrepreneurs in the United States, calling him the “rightful heir to Thomas Edison,” and PBS selected Ray as one of 16 “revolutionaries who made America,” along with other inventors of the past two centuries. He is considered one of the world’s leading inventors, thinkers, and futurists, with a 30-year track record of accurate predictions. Dr. Peter H. Diamandis is an international pioneer in the fields of innovation, incentive competitions and commercial space. In the field of Innovation, Diamandis is Chairman and CEO of the X PRIZE Foundation, best known for its $10 million Ansari X PRIZE for private spaceflight. Today the X PRIZE leads the world in designing and operating large-scale global competitions to solve market failures. Diamandis is also the Co-Founder and Vice-Chairman of Human Longevity Inc. (HLI), a genomics and cell therapy-based diagnostic and therapeutic company focused on extending the healthy human lifespan. He is also the Co-Founder and Executive Chairman of Singularity University, a graduate-level Silicon Valley institution that studies exponentially growing technologies, their ability to transform industries and solve humanity’s grand challenges. REMEMBER TO SAY GOODBYE TO LINEAR THINKING AND SAY HELLO TO ABUNDANCE! Currently at Riverside Majestic Hotel attending Pacific RIM conference on Health Informatics & Multimedia. Focus were given towards FourSquare & Instagram as a new platform to share health knowledge. Facebook & twitter remains the top platform to share "Text Information" rather than graphic information. Therefore the new approach will be " Venue Sensing System" --> FourSquare & "Graphic Sensing System"--> Instagram. This sensory data from both platform are constantly related to the interaction between human behaviour & physical behaviour & the real world. Therefore more research should be done to study venues, pictures & semantic information in order to tackle non communicable diseases such as obesity, diabetes and etc through intersection virtual social network assessment --> Place a person dine, type of food and with whom he or she dines with. Simple Analysis on when to hit the "Like", "Share" or "Retweet" to spread health information. Health Informatics, a new discipline in healthcare is growing rapidly around the world in order to make use and manage health data appropriately and effectively. It is a multipronged discipline that deals with the retrieval, communication and optimal use of health related data, a critical element in sustainable health care delivery. Therefore it is almost impossible to describe an organization without information technology since the intersection and interchange of information is crucial at this point of time. In 1960, computers were in scientific meeting and to understand news human movement and kinetics in order to design prostheses with the use of classic IBM 650, 1620 and 7040. This investment and work led to a paradigm shift in biomedical engineering and within five years, the National Library of Medicine started to use MEDLINE, which was the first medical online library in the world for medical practitioners and researchers to share their work, research and opinions. As health informatics was evolving, in 2004, it finally hit the commercial market, whereby the use of health informatics in hospitals introduced was known as Massachusetts General Hospital Utility Multi-Programming System (MUMPS) which was then modify to Veterans Health Information Systems and Technology Architecture (VistA). VistA was then reengineered for various Hospitals in various countries and it is believed that current health informatics system that exist today in our hospitals is (HIS), are part of MUMPS and VistA once upon a time. Surprisingly, in the UK, health informatics in clinical field also existed in the 1950’s and subsequently evolved to other sub disciplines in pathology on 1960, radiotherapy on 1962, immunization on 1963, and even primary care on 1968. In view of the 2010 strategy This shows how aggressive the British was to promulgate health informatics which we are enjoying today. WHO (World Health Organization) has also been propagating health informatics in various countries and has branded health informatics as an “umbrella” in the evolving discipline of using computing, to support the health related fields in nursing, pharmacy, medicine and dentistry. It is also said that, healthcare will play a significant role and healthcare professionals will need to put in more interest to be computer literate in order to function effectively in a digital environment. Chaudry (2006) mentioned that in hospitals and clinics, healthcare information technology has already been shown to improve quality by increasing adherence to guidelines and decreasing medication errors. This has saved life and increased the patient safety level at organisational level. It also has the potential to improve communications across a difficult geographical terrain, facilitate information to respective providers, patients and community and eliminate repetitive duplication. By rectifying this, we can actually increase the quality of patient care and safety. Now comes the latest trend of social media messaging & reliable health websites that can also provide a good outcome to the community. In fact this approach is considered one step ahead than simple software or mobile health related programs since it allows medical professionals to take the initiative and the lead to educate, communicate & disseminate health information to the community. 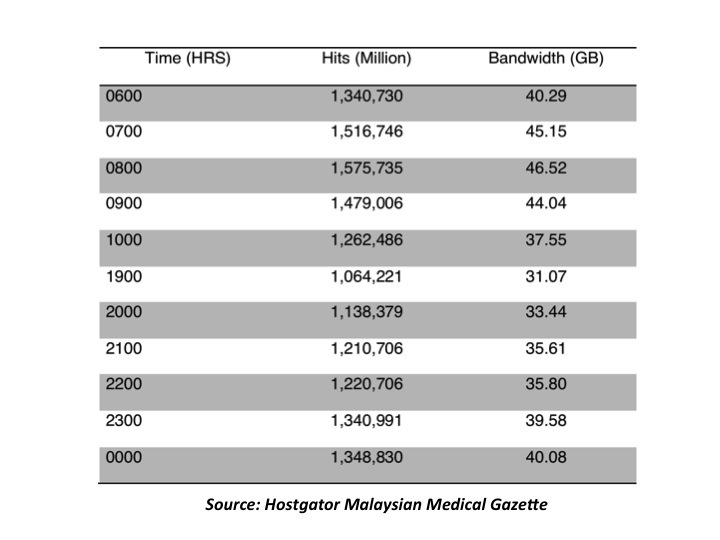 In view of this, the Malaysian Medical Gazette team led by Dr Hidayah Ismawi, Dr Khoo Yoong Khean and myself has performed a short analysis on readers perception & readers attention time span in reading health related articles. 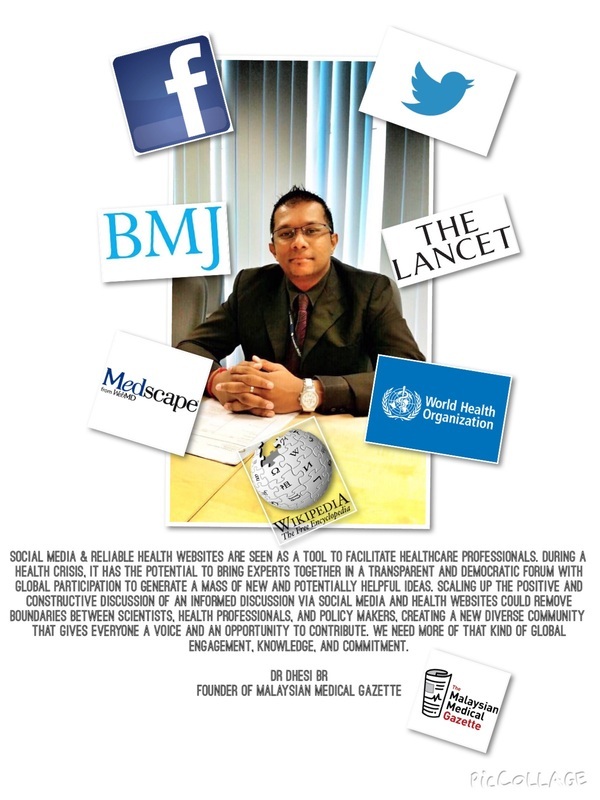 This background analysis was performed in order to maintain Malaysian Medical Gazette's outcome based approach & the sustainability of the gazette in order to execute a good reading material for the public. Another important fact is the duration that a person spends in reading heath related articles. 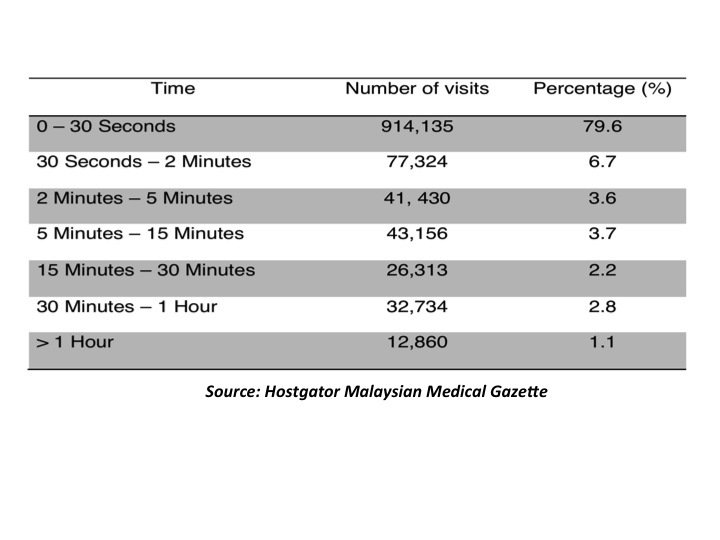 In our service analysis (related to Malaysian Medical Gazette), we realize that maximum attention span for health related article is around 30 seconds, which accounts to almost 79.6% of our readers. This tells us that health related article should be short and concise. Anything more than 1 (A4) page might not get enough attention span from the community. (Refer table below). Conclusion, it is important to always keep track on evidence base intervention. Promulgating health information needs a definite direction. It is almost impossible to shout, blast, like, share or retweet heath articles when you are not sure when is the right time to do it. On top of that, your content should be short and sharp. Hit the right point at the right time doctors. 1. Chaudhry, B. (2006). Impact of health information technology on quality, efficiency, and costs of medical care. Annals of Internal Medicine, 144, 742-752. 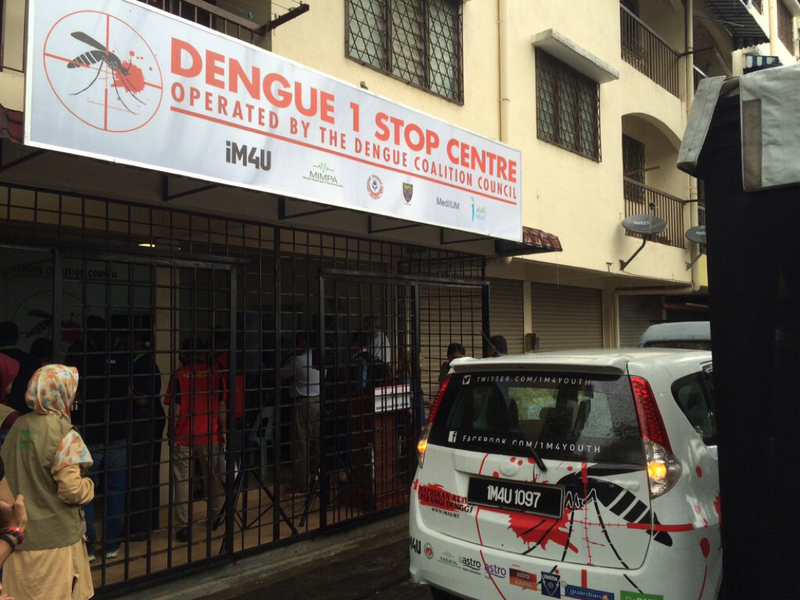 Dengue one stop station was finally launched by the Deputy Director General of Health, MOH. The regional office of World Health Organization for Brunei, Singapore & Malaysia, Dr Graham was also present for this auspicious ceremony. 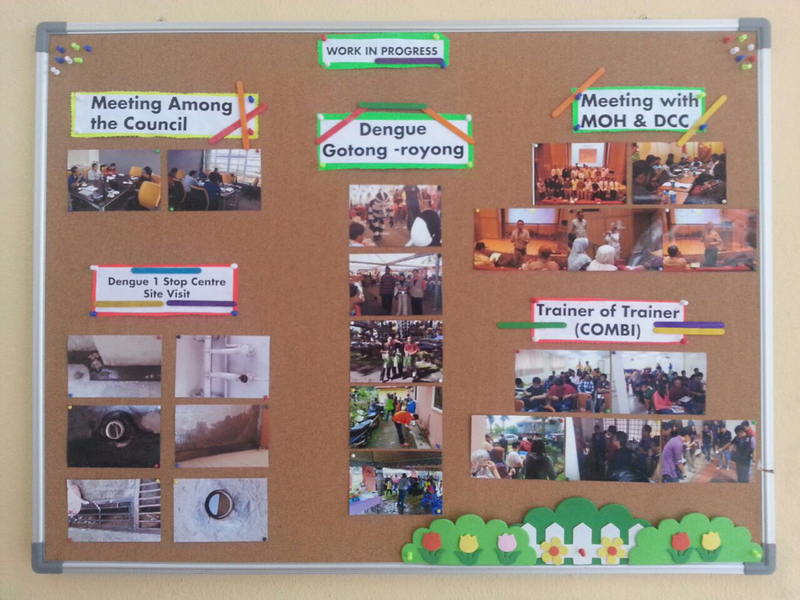 MIMPA leading the coalition of NGOs will focus on health education, awareness, field research & field work, all working through this hub (D1SC) to execute those programs. It is hoped that the Malaysian community will engage themselves and facilitate us through our community mobilization programs. 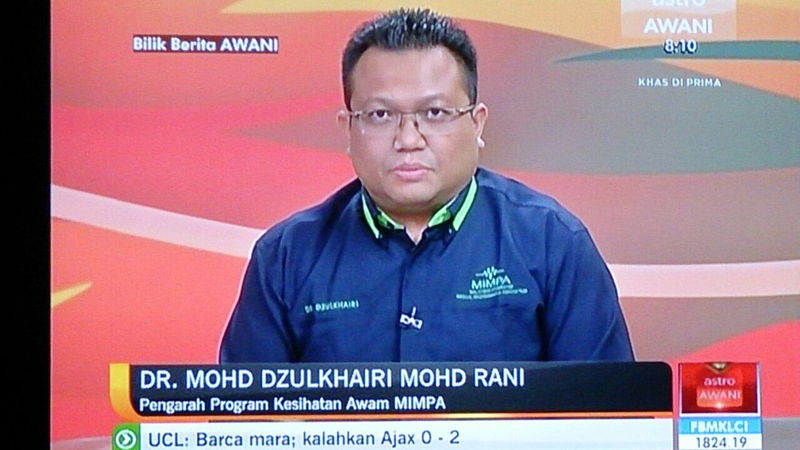 Well done all & special thanks to MIMPA, IM4U, UM, IIUM, IMAM, IKRAM & many more. Who is to be blamed for Ebola? It was long time back when Ebola was just the name of a river but now "Ebola" is a seen as a murdered, killer, tears in blood, death, misery, and fear of contagion. It is also seen to be closely related to political instability & economic turmoil. Everything during the recent epidemic in West Africa was unprecedented. It began in early December, in a village called Meliandou. The first known case was a two-year-old child who died, after fever and vomiting and passing black stool, on December 6. His mother died a week later. 3 months later, local officials informed the Guinean Ministry of Health about these strange clusters & lethal disease. By then, human-to-human transmission had started to multiply due to the local culture, funerals gathering and etc. The outbreak spread to other villages. The strange part is, the reservoir host of Ebola virus is still unknown—even after 38 years of efforts to identify it, since the original 1976 outbreak. Till today, one or more kinds of fruit bat, including the hammer-headed bat, are our prime suspect. Howevere, it is still not 100% proven. The nearest clue that we can figure out could be, that the hammer-headed bats in were in southeastern Guinea during that time. 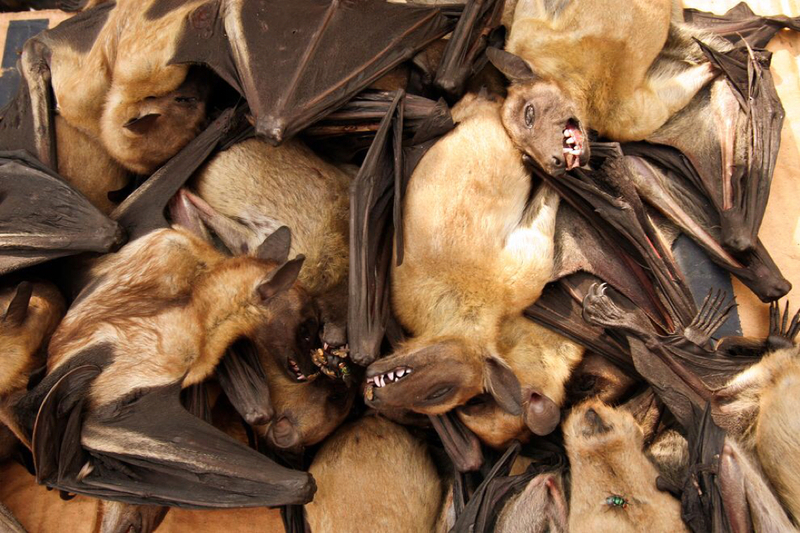 It&apos;s possible that somebody killed the bat for food and brought it to Meliandou, where the child became infected either by direct contact with the bat or by virus passed on the hands of an adult. Based on this, we can understand that, we are not just dealing with the ebola virus but also the reservoir. Ebola virus abides endemically in the forests of equatorial Africa. It will never be eradicated as long as those forests exist, unless the reservoir host itself is eradicated which of course is not recommended. Other possibilities could be directed towards a cure for this viral infection. Our biggest concern remain close to our heart. It is clear that the virus&apos;s is spreading its journey across the evolutionary & geographical landscape. The ultimate question will be, Is it mutating in ways that could make it more dangerous to humans? Is there any chance that it might become transmissible through the air, like the flu, SARS or common cold? Mmmmm.... Well, although Ebola becoming airborne is the ultimate disease nightmare. We should be realistic about it and never jump the gun to say its not possible. Laurrie Garrette explained that, "What is now a fluid-borne virus attaching itself to cells lining the circulatory system can&apos;t easily change into one that targets the tiny air sacs in the lungs. That&apos;s a genetic leap in the realm of science fiction," Garrett wrote. She also explained that The virus probably will not go airborne, but it could conceivably increase its Darwinian fitness in other ways, becoming more subtle and elusive. The genetic study by Gire found 341 mutations as of late August, some of which are significant enough to change the bug&apos;s functional identity. The higher the case count in West Africa goes, the more chances for further mutations, and therefore the greater possibility that the virus might adapt & become more transmissible or even becoming less pathogenic, sickening or killing its victims more slowly, in this case leaving them more time to infect others. "The U.S. Centers for Disease Control and Prevention issued a report, in late September, projecting that under the worst-case scenario there could be 1.4 million cases by early next year. The World Health Organization said Tuesday that new cases could rise to 10,000 per week by December, ten times the rate of the previous month. And the World Bank has warned that costs of the epidemic could reach $32.6 billion, which would be an economic catastrophe for the three West African countries that would compound their health catastrophes" by New York Times. Well, in my opinion, the world won&apos;t be free of Ebola 2014 until West Africa is free of it. Even severe restrictions, barring entry to anyone traveling from West Africa, would not make it impossible for the virus to get into America, or Europe, or Asia. Remember guys, there are too many of us sharing the landscape with the reservoir hosts and sometimes we depend on each another. We are connected by air travel and modern transport. We are the complex creatures. Viruses are simple organisms with well-adaptating skills to fit our modern world. This year it&apos;s Ebola, devastating and scary. Next year it could be something else. Vaccination is unique among de facto mandatory requirements in the modern era, requiring individuals to accept the injection of a medicine or medicinal agent into their bodies, and it has provoked a spirited opposition. 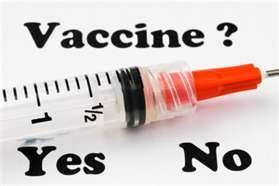 Vaccination is the administration of antigenic material (a vaccine) to stimulate an individual's immune system to develop adaptive immunity to a pathogen. Vaccines can prevent or ameliorate morbidity from infection. The effectiveness of vaccination has been widely studied and verified. Despite the proper study done, there are still parties that spread misleading information on vaccination. Is Vaccination really harmful? Why are people spreading rumours? Basic principles of vaccines - there are two major types. Firstly, an inactivated vaccine; the virus or bacteria are grown in the lab but killed or deactivated. The virus or bacteria is dead but components of it remain and this stimulates the body to produce antibodies. Secondly, live attenuated vaccines; these are live virus or bacteria but with low virulence. They will replicate in the body but at a very slow rate, therefore allowing the body to continuously produce antibodies. Yes, some older vaccines had more severe side effects than current ones do. I'll look at two examples, polio and pertussis, which is commonly known as whooping cough. Before 2000, pediatricians in the US routinely gave kids a polio vaccine that contained live, attenuated polio virus. Now, American kids get a vaccine with an "inactivated," or killed, virus. Very rarely, the live virus in the older vaccine could actually revert to its natural state and cause paralysis, a tragic consequence. Some people in the world still deal with this risk. Live, attenuated polio vaccines are used in some regions where polio is endemic because those who get the live, attenuated vaccine are able to pass on their immunity to others around them, which helps spread immunity more quickly. People are also able to take the live, attenuated vaccine by mouth, instead of in a shot, so it's quicker and easier to get to people in regions where there are few doctors and nurses. Different countries must judge the risks and benefits of the oral polio vaccine differently; even the US had once judged the live, attenuated vaccine worth the risk, when there was nothing better available. No one has gotten polio from the newer polio vaccine. Before the 1990s, kids in the US had a pertussis vaccine with severe potential side effects ranging from fever to fainting fits. Some parents sued vaccine manufacturers, claiming that the shot caused brain damage. Scientists have since determined that the parents' claim is unproven. US doctors now use a new pertussis vaccine with milder side effects. These stories can be very disturbing to us. Of course, it's up to everyone to decide individually whether the risks of a medicine outweigh its benefits. Consider the numbers around vaccines, though. Often, something like 1 in 1,000 kids experience moderate side effects such as prolonged crying. For more severe side effects, such as seizures or that rotavirus-caused bowel blockage, the odds go down to one in tens of thousands. I think it's time for us to educate our community. There is no point of us fighting or going against any anti vaccination movements in this country. I strongly feel that people have the rights to believe what they think is right and it's our duty to guide and sell the idea to them in order to make them believe in us. One will not accept that vaccination is helpful if he or she does not have the belief. We can throw and show a list of studies, research and statistics, but if we fail to understand our community's behaviour , trust me, all the effort of promotions, talks, and other intervention will fail. We should not practice a trend driven intervention but we should, be more specific, I call it tradition drive intervention, know the needs of our clients before advocating any interventions. I always emphasise on community diagnosis. I do understand how parents feel when they ask us the question "Are these vaccines really safe doc?" There is no doubt that stats by CDC and WHO have proven that vaccines have tremendously brought down the rate of infectious disease in this country. 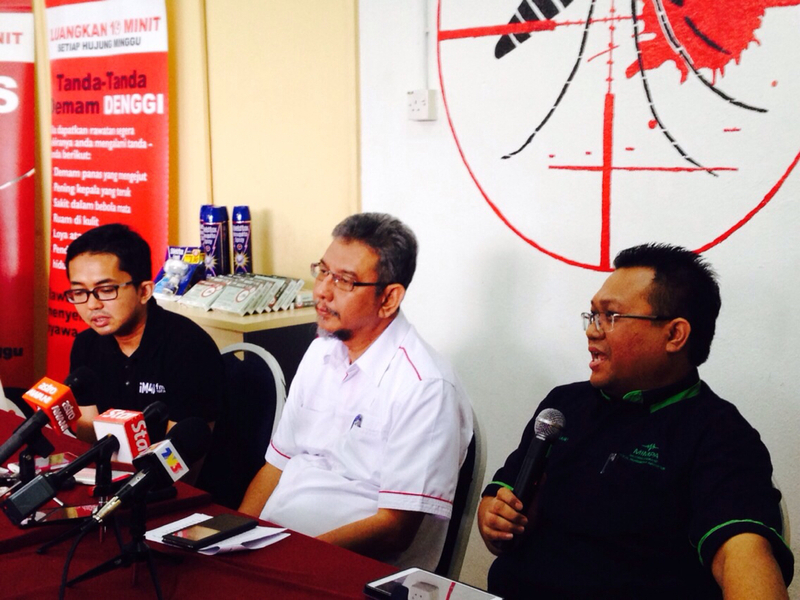 But it is still our duty to strengthen the existing vaccines we have. We have to build the trust of our clients, only then will they feel and have the belief that our vaccines are safe. For instance, we all know that vaccines depend a lot on cold chain. It is important not to break the cold chain in order to preserve the effectiveness of our vaccines. We do face power cuts in rural areas of Sabah and Sarawak and this is one of the main issues that parents are worried about. So it is best that we rectify these problems before we advocate and put the blame on parents for not listening to us or not believing in us. To our dear parents, no doctors, no scientists and no researchers in this world have the intention to harm your kids. It is, with the best scientist, that reliable and valid studies are done on vaccination. History and figures have factually proven that vaccination has been an elite and the best way to prevent infectious disease. If you have doubts, please do consult us and give us the chance to explain the very core aspect of your doubt in order to have a positive attitude towards vaccination. When a person possesses the proper beliefs, only then will they agree that the product (vaccines) is useful and beneficial to one's health - and that is our aim in Malaysia. In conclusion, the insistent questioners of mainstream practice will not go away and will not be silenced. They will trouble majorities. The wise goal is to promote understanding between healthcare personnel and our clients that can at least see to it that the troubling is creative and not merely disruptive.